1. 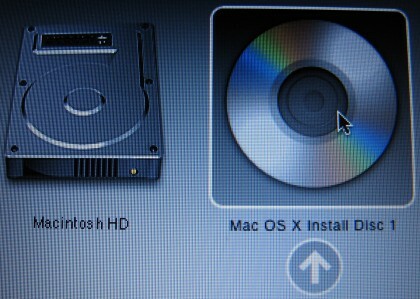 Holding down Option shows the boot menu so you can specify booting from a CDROM or USB/Firewire disk (picture shows bootup menu when inserting the Mac OS X Install Disc and holding Option key down on boot-up). 2. Holding down SHIFT ejects any discs in the drive. I screwed it up... have my first MacBook for two days. Booted from Ubuntu CDROM... didn't boot Mac OS anymore. posting from "not a mac"
Macs are waay too much like women... beautiful and amazing, completely, utterly incomprehensible once you step behind the curtain, take the red pill, go down the rabbit hole. uglph... I just threw up. just a bit. ok no more metaphors. I fix pcs, and they break all the time, so business is good! took a mac client. just a hard drive. no big deal. WRONG!!! 64 screws later, I was crying into a box of tissues at my shrink's office. Really. then you came along, and dawn has never looked so good!! Thanks for the "option" tip. damn, macs are soo weird. why cant the option screen be black and chunky and communicate in a way guys understand??? What is the key short for powering up the mac from off power.